The new school year feels well underway, even if for some of you it only started 15 days ago. It is amazing how quickly something new can become familiar, how quickly sparse classroom spaces can become filled. Whether it has been a few weeks or a few months, many of you are seeing your classrooms fill up with supplies, student work, and charts. The curse of the classroom is beginning to creep in: clutter. While a certain amount of clutter is unavoidable, most can be kept under control with ongoing maintenance. But when it comes to charts, clarity is key. The brilliant cognitive and educational psychologist Jerome Bruner announced over forty years ago that “we easily become overwhelmed by complexity and clutter” (The Relevance of Education 1971, 4). He advised coming up with strategies that reduce this to only the things that matter. When we consider complexity and clutter as they relate to the charts in our classrooms there are three key questions to think about: which charts need to be displayed, how much information is needed on each chart, and what is the ratio of visual and symbols to print. Let’s take a closer look at each one of these questions. Which charts need to be displayed? Space is limited and too many charts can quickly cause clutter rather than clarity, so you want to make sure the charts hanging up in the classroom are the ones that are needed and used by the majority of your students. Any charts that are supporting your current units of study should be available for students to use, just not too many. 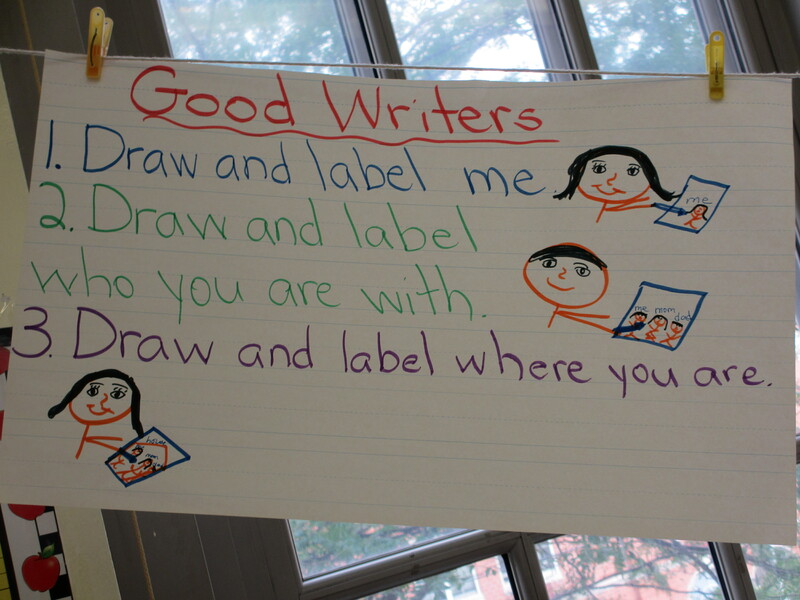 For example, Stephanie LaPorta, an extremely thoughtful Kindergarten teacher at PS 176 in Bay Ridge, Brooklyn has three writing charts currently hanging up in her classroom. One is about planning (process), one shows what is expected (exemplar), and one gives some tips for writing words (procedural). Because they support the current unit she and the children both refer to them during every writing workshop. They can do this because there are not too many. This is a writing process chart. 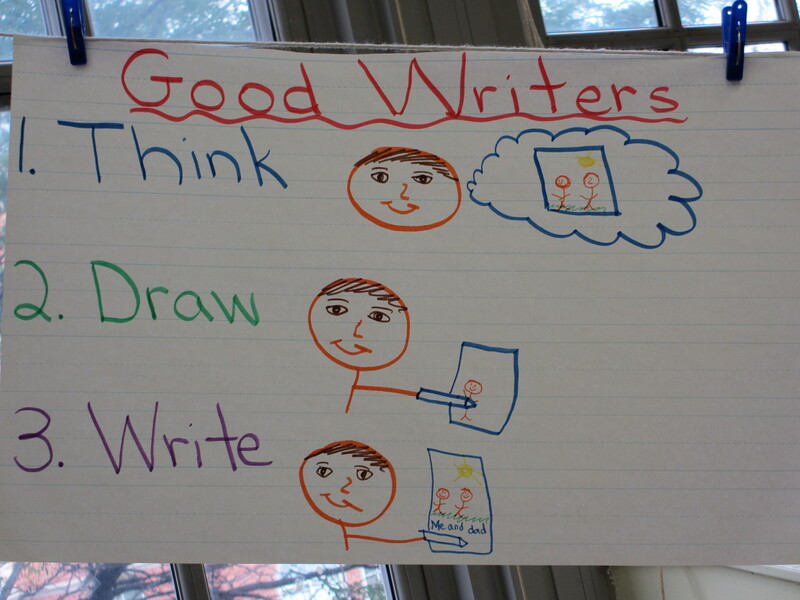 This chart shows children examples of some things they can include in their drawings. Another reason to keep the number of charts down to just the ones needed is that a jumble of charts can be disorderly and confusing. Children don’t know where to look first or where to find what they are looking for. If you are trying to determine which charts are worth keeping just ask your kids: “Which chart helps you the most?” “What is a chart you do not use?” “Why?” You can also take a few moments to observe your children. Do any children occasionally look up at a chart or walk over to a chart while they are working? We include two checklists with other questions in the Appendices of Smarter Charts. How much information is needed on each chart? A chart is not only a record of our teaching, but a synthesis of what is to be learned. We don’t need to write down everything we say on a chart, just the essentials. Putting this information into simple phrases and sentences work best because it is clear and quick to read. Jenna Peppaceno, an amazing Kindergarten teacher at PS 242 in Flushing, Queens, has worked hard to make the complex simple for her class full of English Language Learners. 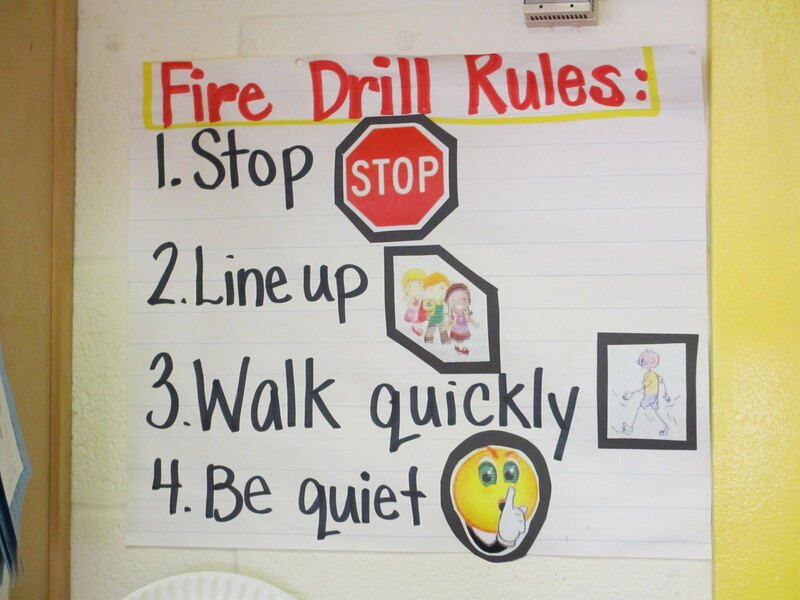 The chart she created to help her students remember and follow the rules necessary during a fire drill contains only the most important things they need to do when they hear the bell ring. The chart hangs by itself next to the door, which also makes sure the children can find it when needed. This chart contains the essence of what is important to do during a fire drill. Another chart she made sets up the expectations for the writing workshop and uses simple sentences and children’s examples to show what is most important. This chart hangs above the writing center and has clear space around it. This makes it not only easy to find, but helps it stand out and make it easy to focus on. 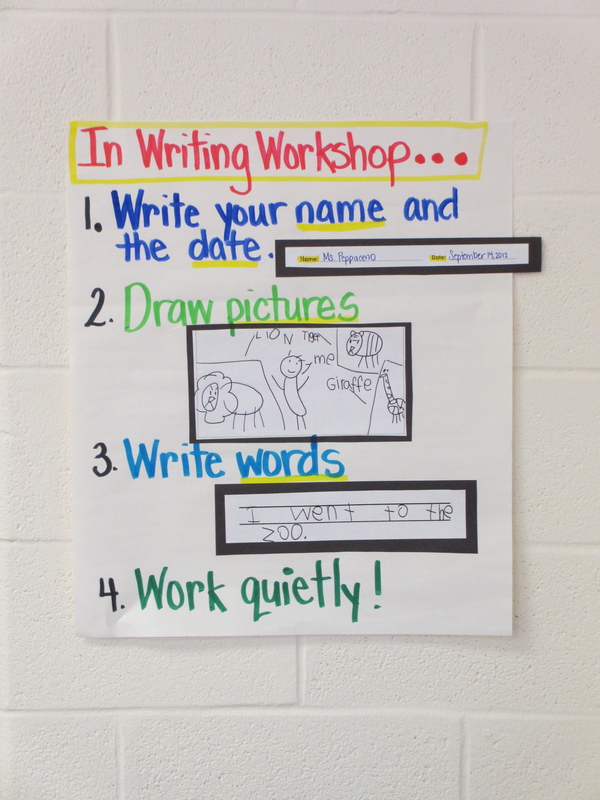 This chart shows the expectations for writing workshop at the beginning of the year. What is the ratio of visuals and symbols to print? To answer this question we look to the world of advertising where the use of visuals and symbols reign. Combine this with the fact that our young children were born into a world of icons and symbols. Just think McDonalds or Target and what most likely comes to mind first is a yellow arch-like M or a red and white bullseye, not the printed words. We should keep this in mind when we are making charts, because it is the visuals that are often recognized and remembered most. If there are more words than pictures, this can demand more reading (if the children can read the words), which in turn takes more time, slowing down how the information is processed. A chart is meant to be a quick reminder of something that was taught, so the visuals and symbols are critical. There should be at least a 1:1 ratio of visual or symbol to print. If you look at another chart Jenna made for her Kindergarteners to remind them of the morning routines, you will actually see more of a 2:1 ratio. She has broken down each morning routine step into clear steps using clear pictures. The first step shows a picture of a pocket folder, then an arrow pointing to a picture of white bin, and the word “Folder” written on a label next to the two pictures. Because she has so many ELLs, combined with the fact that many are still four, or just turned five, the written word is not the most important thing on this chart. But every child can understand the pictures. And the arrow symbolizes the actions that have been demonstrated and practiced many times. 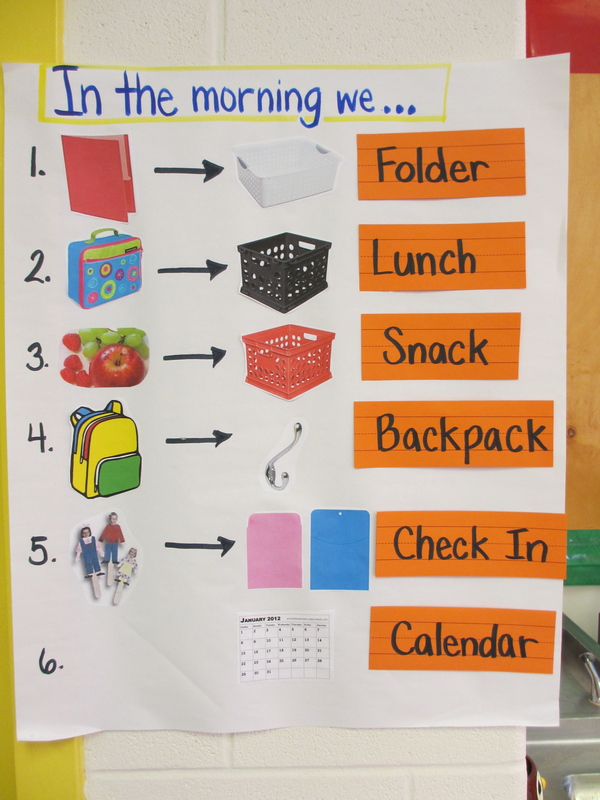 This chart uses visuals to remind children of what they should do with their belongings in the morning. 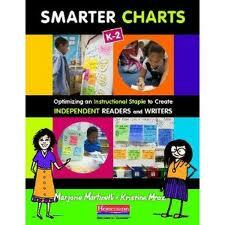 So before things start piling up, take a moment and look at the charts you have up already in your classroom. How many are important and being used or should be used? Is what’s on the chart essential? Is the ratio of visuals to print at least equal? Remember, when it comes to charts, less can indeed be more, making clarity key. Thank you for your wonderful response (and never too long!) and we are so glad you are finding chartchums helpful. The charts for first graders are not that different in terms of the amount of visuals to print and the amount of information on the chart. We do try to show a range of grade levels, so stay tuned. You can also check out some of the earlier posts where we have samples of various first grade charts. Welcome back to the classroom!